Invasive species present a huge challenge to anyone who owns or manages land, whether it be a backyard garden, a small wood lot, a city park, or a national forest. If you have ever spent time trying to reclaim a forest understory dominated by bush honeysuckle or pull garlic mustard sprouting up among native spring wildflowers, you have experienced first-hand the frustration of coming back year after year to treat the same species. Even if you manage to get rid of every stem of a particular invasive plant on your property, you will still have to return year after year to monitor and treat new seedlings if your neighbor still has that invasive plant on an adjacent property. Invasive plants don’t see property lines, and they will set up shop anywhere they can find an opening. To be successful at ridding our gardens, parks, and natural areas of invasive plants, we need to deal with invasive plants on a larger scale, taking a coordinated approach to prevention and control across the entire landscape. CWMAs have had great successes in early detection, on-the-ground control, and raising awareness about invasive species in their areas. Here are just a few of the things that CWMAs have been able to accomplish in the last few years. – The Northwoods CWMA in Wisconsin got their local road department to alter roadside mowing and maintenance activities to prevent the spread of invasive plant seed by road department equipment. – The River to River CWMA in Illinois created a Strike Team that treated 25 invasive plant species on over 1600 acres in the CWMA in 2011. The Strike Team also found and treated 11 populations of new invaders, including kudzu, Japanese chaff flower, and burning bush. – The Southern Indiana CWMA trained a team of volunteer Weed Watchers to identify and report new infestations of 18 priority plant species. – The Hawkeye CWMA in Iowa holds an annual field day to educate the public about invasive plant identification and control. – Several CWMAs have created community tool sheds with shared resources (e.g. backpack sprayers, loppers, shovels) for all partners to use. – Many CWMAs have set up booths at local farmer’s markets, county fairs, or other events to provide brochures and answer questions about invasive plants for the general public. Setting up a CWMA takes some time and some planning, but the payoff can be well worth the investment. The Midwest Invasive Plant Network encourages local landowners and interested public in Appalachian Ohio to join the Appalachian Ohio Weed Control Partnership and help in their efforts. 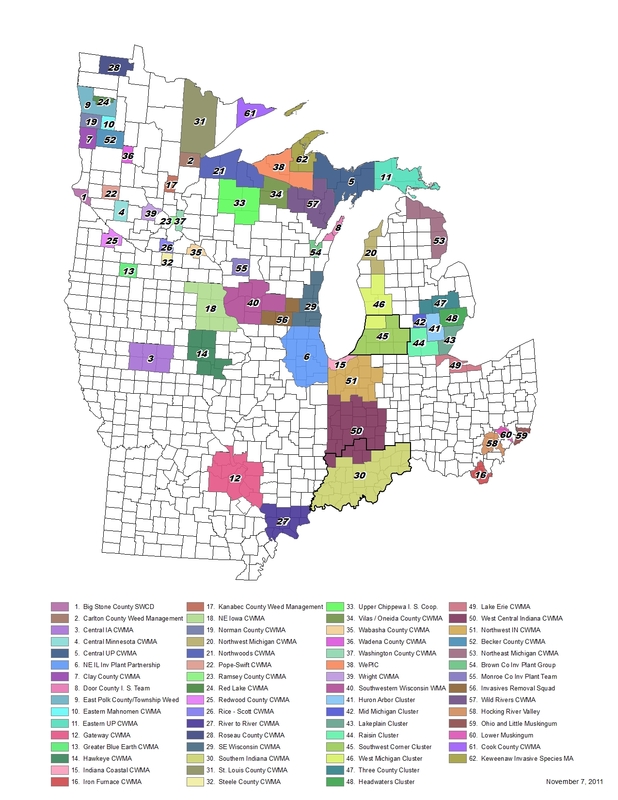 The Midwest Invasive Plant Network is an organization focused on reducing the impacts of invasive plant species in the Midwest. Our goal is to improve the quality and quantity of information available on invasive plants to assist with education, prevention, early detection, and control. Visit our website to see what we have to offer (www.mipn.org). The Midwest Invasive Plant Network has created several educational materials on invasive plants that are available at low or no cost. For more information on our publications, visit http://www.mipn.org/publications.html. If you don’t live within the boundaries of the Appalachian Ohio Weed Control Partnership, check our map to find a CWMA in your local region. Still can’t find one? Consider working with others in your area to develop a new CWMA. On our CWMA resources page (www.mipn.org/cwma_resources.html), you will find a step-by-step guide to starting a CWMA, called the “CWMA Cookbook”, as well as a companion PowerPoint slide show. You will also see links to sample organizing documents for CWMAs and links to CWMA websites. Invasive plants are a daunting problem, but the Midwest Invasive Plant Network is here to help. We hope you will consider starting or joining a local CWMA to help get the upper hand on invasive species in your area. Invasive plants are spreading in Southeastern Ohio landscapes, lakes, and rivers. Aggressive non-native invasive plants alter the natural environmental, destroy wildlife habitat, and threaten our economy by interfering with timber and agricultural production and recreational opportunities. An invasive plant that is spreading throughout Ohio is bush honeysuckle. There are four different species of exotic bush honeysuckle that are similar in appearance and equally invasive. With attractive flowers and high fruit production, exotic bush honeysuckles were introduced from Eastern Asia and promoted for use in shelterbelts, wildlife habitat improvement, and landscaping. However, planting exotic bush honeysuckle in your yard or woodlot can be detrimental to songbirds, the health of your woodland, and your wallet if timber production is a goal. 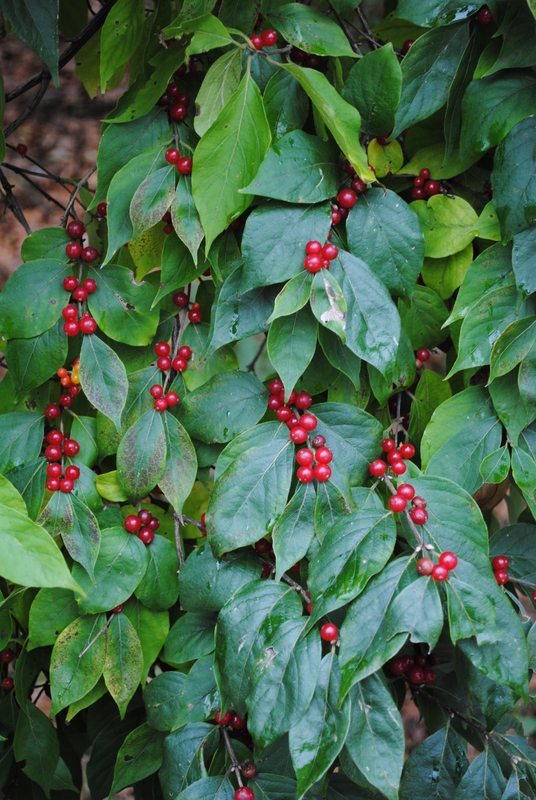 Bush honeysuckle produces an abundance of berries and birds readily eat them when there are few native food sources available. However, honeysuckle berries are high in carbohydrates and do not provide the high fat content that native plant food sources do. High energy foods are important for birds preparing for long migratory flights of hundreds to thousands of miles. Highly invaded areas also provide poor nesting habitat since nests are built closer to the ground in these shrubs making eggs and nestlings more likely to be food for stray cats and other predators. Bush honeysuckle aggressively invades fields, roadsides, right-of-ways, forest edges, and open woodlands through bird-dispersed seeds. Exotic bush honeysuckles leaf out earlier in the spring than most native plants and maintain green leaves into the fall after most plants are dormant. This long growing season allows them to shade out native wildflowers and shrubs. Imagine a spring and summer without a diverse mix of native wildflowers blooming along woodland edges and fields! Exotic bush honeysuckles also hurt the economy of our region. Thickets of this shrub can slow the growth of canopy trees and prevent new seedlings from establishing. The timber industry and jobs associated with it are dependent on the health and productivity of our forests. Fall is a good time to identify exotic bush honeysuckles since they hold onto their leaves much longer than native plants. These shrubs have tall 6-15 ft arching branches with hollow centers. The leaves are 1-3.5 inches long with smooth edges, short stalks, and arranged in pairs along the stem. Stems are grayish-brown and as they age begin to have broad ridges and grooves giving a striped appearance. Fragrant tube-like flowers form in pairs along stems during the spring and are white to pink in color and fade to a creamy yellow. Berries form in clusters of 2-15 from mid-summer to early fall. Berries are most often red, but occasionally are orange or yellow. Our native bush honeysuckles can be differentiated by their solid stems, finely toothed leaves, and long pointed vase-shaped capsule fruits. Information for the control of exotic bush honeysuckles can be found at OSU-Extension – Controlling non-native invasive plants in Ohio forests: bush honeysuckle – 1.8 mb or by contacting Eric Boyda at 740-534-6578 or appalachainohioweeds@gmail.com. Photo credit: Eric Boyda. Non-native invasive plants have been introduced from a different area and are causing damage to either the natural environment or our economy. Since non-native invasive plants have often been brought here from other counties or continents, they are free from the natural herbivores, insects, parasites, or competitor found in their native habitats. Because of this lack of natural population controls, invasive plants often have large and expanding populations. Often these plants will out compete and displace native plants of the region. This change in plant composition can have devastating impacts on native wildlife and plants of the area. Critical ecosystem functions can be altered as soil or water chemistry is changed, fire frequency or intensity is modified, and biodiversity is reduced. Invasive plants can reduce the productivity of lands as they compete with or contaminate agricultural produced and slow the growth of timber. Some plants can even cause direct harm to humans and domesticated animals. The economic toll invasive species have on the United States is above $120 billion annually excluding of the loss of biodiversity, ecosystem services, and aesthetics, which are difficult to assign a monetary value to. Had those three been included in the estimate, the calculated value would be several times larger. 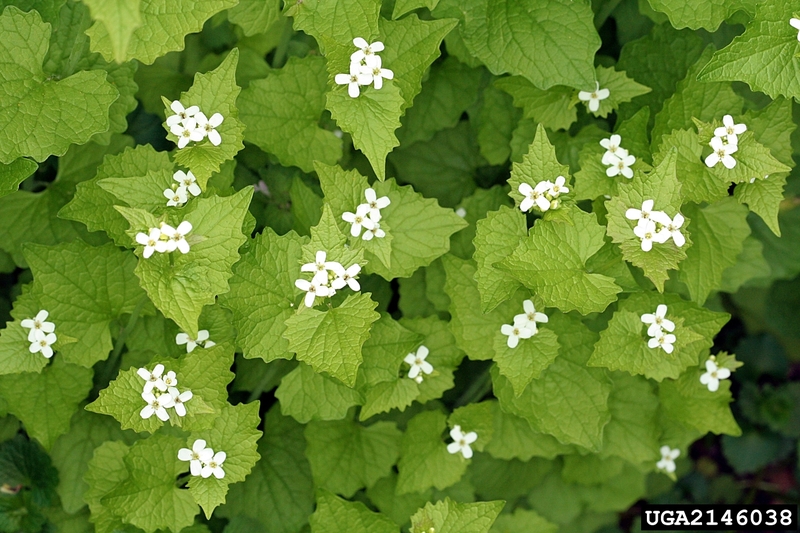 Follow this link to learn about why you should care about invasive plants!